The 2004 – 2005 season marked the Suns’ return to the NBA’s elite, finishing with the best record at 62–20, and tying a franchise record set by the 1992 – 1993 team. This was a major improvement from its 29-53 record just the season before. They ended up setting a team record for greatest 1-season improvement, 33 games. This feat was made possible by the off-season unrestricted FA signing of All-Star point guard Steve Nash from Dallas who had formerly played for them at the beginning of his career. Nash went on to win the MVP award that season. Amar’e Stoudemire and Shawn Marion were named All-Stars and first year coach, Mike D’Antoni, was named NBA Coach of the Year. The 2005 – 2006 NBA season began with Stoudemire undergoing microfracture surgery in his knee on October 18, 2005. He missed all but three games that year. Along with that, shooting guard Joe Johnson demanded a sign-and-trade deal to the Atlanta Hawks, in which the Suns got Boris Diaw along with two future first round picks. Other acquisitions that year included Raja Bell and Kurt Thomas. Despite the turnover in players, the Suns were once again able to win the Pacific going 54–28 and capturing the second seed in the Western Conference. 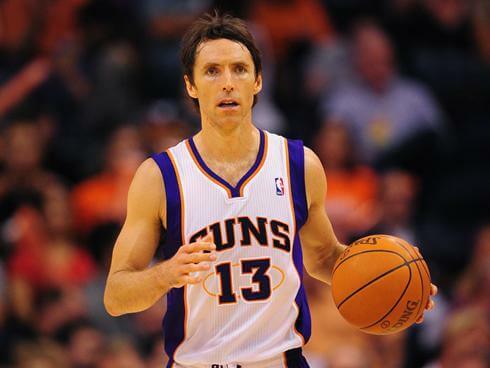 Nash was awarded a second consecutive NBA Most Valuable Player Award, becoming the second point-guard (Magic Johnson was the first) to win the award in consecutive seasons. Also, Diaw was named NBA Most Improved Player.